The FAR infrared heating strip can be used inside or out and they are ideal for larger or hard to heat areas. The infrastrip gives out infrared heat which is the same heat as your body produces and of course, the sun. Making them a very healthy and natural heat source. The infrastrip is curved in design which provides excellent heat distribution. Warming the people beneath it and minimising the heat loss associated with convection heating which heats the surrounding air. 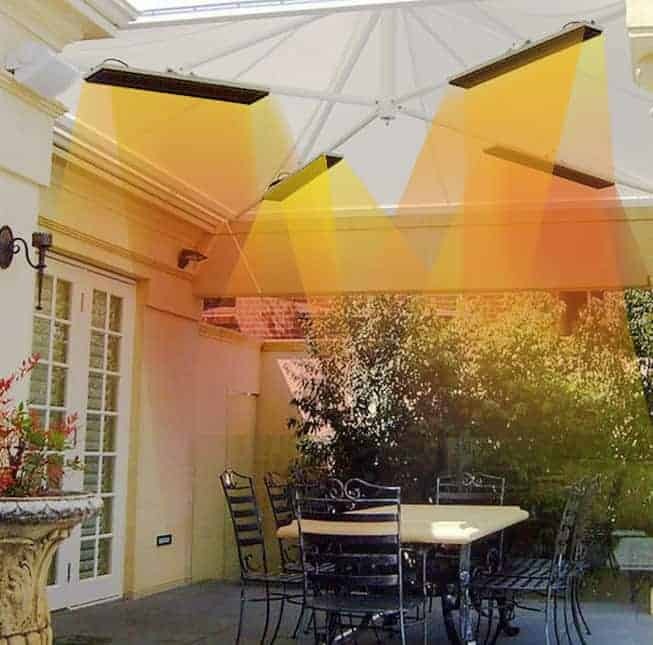 The Infrastrip has an IPX4 rating which means that it is protected from splashing water at any angle so can be used in covered outdoor areas. as well as inside. The Infrastrip heats what objects and people and has the same effect as when the sun shines on you. It heats up the fabric of the objects and, in turn this raises the ambient temperature of the room or area that it is heating. Our infrastrips can be plugged straight into the electricity socket and used with or without a thermostat or time controller on our standard models or if you want to control the time in 2, 4 or 8 hour blocks and the power by 25 , 50 or 100% then use one of our models with a built in timer and remote control. People do not like being cold and therefore to keep you customer browsing and shopping it is important that you keep the area warm. This is easier said than done in a premises where the doors are constantly opening and closing losing not to mention expensive. The Heat Strip can be fitted above the door and felt the instant the customer walks in, above the counter area or strategically placed around the shop to ensure the place remains warm. In a garage or workshop where the front of the units remain open for prolonged periods allowing the cold air in makes them difficult and expensive to heat. Traditionally gas space heaters are used but as they heat the air the effects are short lived once the units are switched off the air gets cold very quickly. 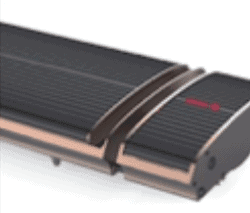 The Infrastrip provides directional infrared heating and, as they do not rely on heating the air, can be used to effectively heat the work area. Strategically placed and directed at the staff they will feel the benefits immediately. In Restaurants, pubs, museums and other large, hard to heat spaces, the infrastrip can help overcome this issue. With the infrastrip varying in size from 1Kw to 3.2Kw they provide an instant and long lasting heat solution. In churches and rooms with high or vaulted ceilings the infrastrip can be fitted lower down on the wall or hung from the ceiling to heat the space and the people within it. As the units heat the fabric of the room and the people and not the air they are far more effective than convection type heaters. There is always much more heat loss through glass than walls, even if they are double glazed. There can also be issues with condensation in conservatories and other rooms with a lot of glass windows. The infrastrip will keep theses spaces warmer than convection heating methods and can also help to alleviate damp, mould and mildew caused by condensation in these areas. The Infrastrip can be used outside to heat smoking areas as well as extending that summer feeling on you balcony, terrace or patio for both domestic and commercial environments. Infrared heaters provide a lot of health benefits and, as such have been used to encourage bulls and stallions when mating. They can keep the area warm and dry without the same risk of fire associated with halogen heaters. Get your Infrastrip pricing now!